The Series 8500 Butterfly Valves can be used in a wide range of agricultural, as well as industrial applications. They are a wafer style valve and mount between standard ANSI 125#/150# flanges. 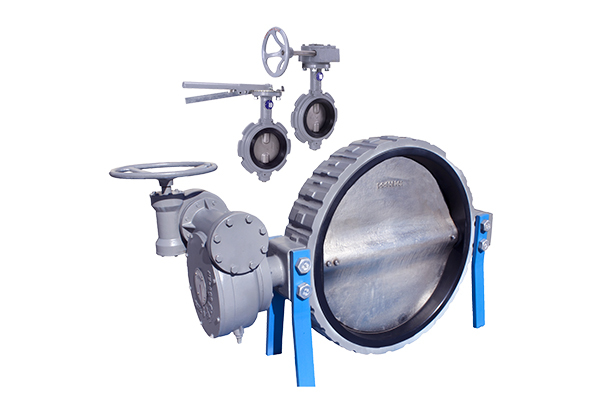 The butterfly valve can be used as a shut off valve, and in throttling applications. With features like epoxy coated bodies, nylon bearing, and Buna-N liner; this valve ensures a long-lasting, reliable use. State-of-the-Art Manufacturing: Valves are produced using state-of-the-art valve manufacturing equipment. Each valve is tested to 110% of rated working pressure to ensure the quality. Advanced Seating Profile on Disc: Three radius seating profile reduces operating torque while providing bubble-tight and positive shut-off. The disc seating surface is precision machined and polished for low operating torque and longer seating life. Multiple Stem Seals: The primary stem seal is achieved between the disc and seat. Secondary seals are incorporated into both the upper and lower stem to backup the primary stem seal. Maintenance-Free Stem Bushing: Graphite polymer bushings are self-lubricating and require no maintenance. The bushings provide low friction stem support for easy operation and long service life. Upper stem bushing prevents foreign matter from entering the valve. Phenolic Backed Cartridge Seat: Non-collapsible phenolic backed cartridge seat provides superior sealing integrity. The rigid backing ring eliminates high torque and premature failure caused by elastomer distortion found in butterfly valves with non-rigid seat designs. Multiple Seals on Seat: Integral flange seals molded into the edge of the seat require no flange gaskets. Secured and Precision Connection Between Disc and Stem: Secured and precision connection on stem-disc joint provides maximum strength of disc/stem connection and minimum unwanted free travel. Investment Cast Disc (2"-12"): Uniform and smooth surface finish. Streamlined for maximum flow and minimum seat wear. Heat Treated Stem: Stem material is heat treated with 400 series stainless steel material that provides additional tensile strength. Lockable Lever Handle: The 10 position lever handle is lockable to provide tamper-proof flow control. Locking mechanism accommodates standard padlocks.